Un hommage appuyé d'un swiss et d'un Mac. Le succès musical des Beatles n'est pas sorti de nulle part, et ne repose uniquement sur leur génie. Les Fab Four ont également puisé leur inspiration chez des artistes de leur époque, tels que les Everly Brothers, duo américain pop-folk. Le cadet de la fratrie, Phil Everly, est décédé le 3 janvier 2014 à l'âge de 74 ans, des suites d'une maladie pulmonaire. De la fin des années 1950 au milieu de la décennie suivante, avec son frère aîné Don, ils ont aligné tube sur tube. Sur son compte Facebook, Paul McCartney est dithyrambique : «Phil Everly était un de mes plus grands héros. Avec son frère Don, ils étaient une des influences majeures des Beatles. Quand John [ Lennon ] et moi avons commencé à écrire des chansons, je faisais Phil et lui Don ». Un duo de l'ombre qui a servi de modèle pour la paire la plus connue de la pop et du rock, mais aussi pour toute une génération d'artiste comme Simon and Garfunkel. Un respect réciproque qui conduira les deux hommes à collaborer ensemble quelques années plus tard. « Quand j'ai enfin rencontré Phil, j'étais frappé et extrêmement impressionné par son humilité et sa douceur », témoigne Paul McCartney. En 1984, le bassiste composera une chanson pour les Everly Brothers qui sera leur dernier succès commercial. ‹ On the Wings of a Nightingale › est la piste qui introduit l'album ‹ EB84 ›, qui marque le retour du duo après onze ans d'absence. Avec son frère Don, ils étaient une des influences majeures des Beatles. Quand John [ Lennon ] et moi avons commencé à écrire des chansons, je faisais Phil et lui Don ». Ou alors carrément ...les Fab Six ! 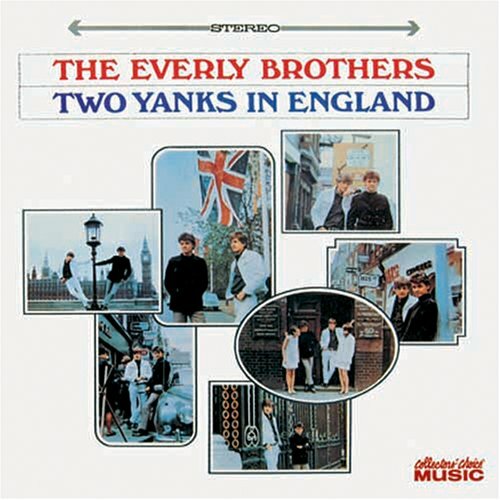 Two Yanks in England is an album by The Everly Brothers, released in 1966. The backing band on most of the recordings is actually The Hollies and eight of the twelve songs featured are credited to L. Ransford, The Hollies' Allan Clarke, Tony Hicks, and Graham Nash songwriting pseudonym. Jimmy Page and John Paul Jones are also purported to play on the record as session musicians. Also, in a recent interview with Graham Nash on David Dye's "World Cafe", Reggie Dwight (aka Elton John) played on the album. Two singles were released from the album; "Somebody Help Me" b/w "Hard Hard Year" in late 1966 and "Fifi the Flea" b/w "Like Every Time Before" in early 1967. Ah oui, je ne connaissais pas du tout. Ni aucun des titres que tu cites. Ca n'a pas bien marché ? Ou du moins, moins bien que les précédents ? Mais c'est pas mal. Et donc, du coup, c'est l'histoire des arroseurs arrosés ? Ce sont les Beatles qui les ont inspirés, tu dis ? Un medley avec Gerry And The Pacemakers. Comme ça, la boucle avec Liverpool est bouclée. (surtout à George Martin - ou Epstein ? - qui voulait leur faire chanter). Ca a moins bien marché parce que les Everly n'étaient plus dans leur période la plus prolifique au niveau des ventes. Inspirés par les Beatyles ? En tout cas, une tentative de se mettre dans "l'air du temps", donc "Deux garçons dans le vent" ! Ils auraient repris The End de Abbey Road. BACK IN DECEMBER 2012 I interviewed Will Oldham about the album of Everly Brothers covers that he’d just recorded with Faun Fables’ Dawn McCarthy. We’re both huge fans of the brothers’ work – especially the beguiling B-sides and heartbreaking covers they cut for Warner Brothers in the late ’60s – but, understandably, Oldham was deeper into their back catalogue than me and opened my eyes to a double live album I’d always assumed was but four sides of contractual filler. 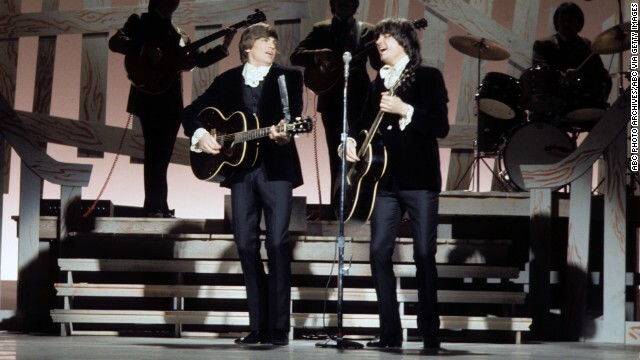 Of course, you should never do that, and 1970′s The Everly Brothers Show proves the rule. Recorded live at the Grand Hotel in Anaheim, California on February 6, 1970, The Everly Brothers Show was produced by Lou Adler and saw the brothers backed by a crack team featuring Milwaukee guitar instrumentalist Sam McCue, Walker Brothers stalwart Al “Tiny” Schneider on drums and Robert Knigge on bass. At first glance, the album appears to be little more than your standard live ragbag of ’50s Everly classics and rock’n'roll oldies – Maybellene, Suzie Q, Bird Dog, Wake Up Little Susie – but it also contains some stunning versions of more recent material – a hard-driving cover of 1967 single Bowling Green and a stripped-back, soulful rework of Lord Of The Manor – and a twenty minute medley that now ranks as one of my favourite side-long album tracks. Talking about the Medley in 2012, Will Oldham said, “This is one of my favourite tracks of recorded music anywhere. It’s frantic. The one potential promise of jazz that didn’t seem to come into fruition was great musicians taking popular songs and just kind of riffing on them. It seems like that stayed within a jazz tradition. But this is close. 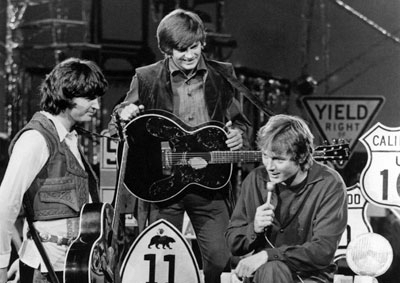 The concert was filmed, and sections were shown on the Everlys’ 1970 ABC TV vehicle, also called The Everly Brothers Show. This five-minute clip is taken from that medley and shows Don and Phil moving seamlessly from Chuck Berry’s Rock And Roll Music into Abbey Road‘s valedictory coda, The End. In light of the brothers’ acrimonious split in 1973 and, of course, Phil Everly’s recent passing, the sequence now feels incredibly moving, especially as everything Don Everly sang around this time was touched by shades of night. It could be just a cover. But given the brothers’ troubles, it could also be a gesture of reconciliation, an admission of guilt, an onstage taunt. However you read it, the whole Medley feels like a conversation, a sibling narrative running between two brothers who, by that stage, had pretty much given up on talking to each other off-stage. If you don’t believe there’s something else going on here, other than the standard Vegas segue-fest, just watch how Don and Phil effortlessly glide from the saccharine hippie optimism of The Hair Soundtrack’s Aquarius into the cold, romantic pessimism of The Price Of Love and Joe South’s zero-sum game The Games People Play. ...and a twenty minute medley that now ranks as one of my favourite side-long album tracks. Je ne sais pas si c'est dispo sur la toile ? 1970... ça doit être un truc dans ces eaux-là. The Everly Brothers, Don and Phil, had guested on many music and variety shows by the time they became TV headliners with this summer-replacement series in 1970. Though it lasted only three months, "Johnny Cash Presents The Everly Brothers Show" rides high on the Everly's engaging personalities, gorgeous harmonies and rapport with fellow musicians. The Archive has compiled a selection of highlights from seven of the show's 10 broadcasts, including musical numbers by Don and Phil, Johnny Cash, Linda Ronstadt, Tina Turner and Stevie Wonder. This program also includes a compilation of the Everly Brothers pre-1970 TV appearances, featuring many of their early hits. Executive Producer: Harold D. Cohen, Joe Byrne. Producer: Bernie Kukoff, Jeff Harris. Writer: David Pollock, Elias Davis, Mike Settle, Jeff Harris, Bernie Kukoff, Allyn Ferguson. Music: Jack Elliott. Host: Don Everly, Phil Everly. Filou, j'avais posté le medley (la partie The End) sur ce sujet sur la page précédente. Je dis ça, je ne dis rien hein ? Ah c'est ça la cover de The End ??? J'avais pas reconnu du tout. C'est un medley de plein de trucs mais pas de Beatles, si ? C'est dans le style The End alors ? Pas le morceau en lui même ? Un peu décevant pour le coup. Un peu survendu, le truc, non ? Tu rigoles, il est fabuleux ce medley ! Bon là ce n'est qu'un extrait hein ? Ils ont poussé l'idée d'un You Can't Do That de Nilsson jusqu'au bout. Ils ont poussé l'idée d'un You Can't Do That de Nilsson jusqu'au bout. Non mais je vais essayer d'écouter ça tranquillement de chez ouam. Après, si Everly peut nous dégoter le truc complet... Ben quoi, il est de la famille ou merde ? Paul McCartney said that he and John Lennon used to pretend they were the Everly Brothers: "When John and I first started to write songs, I was Phil and he was Don. Years later when I finally met Phil, I was completely starstruck and at the same time extremely impressed by his humility and gentleness of soul."